(Photos courtesy of Layn Mudder of LPT Images.) 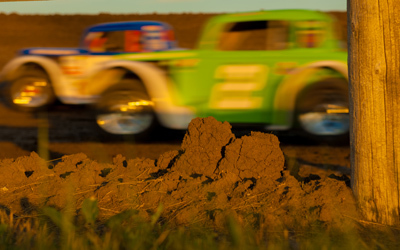 The Dakota Legends Tour visited the Dacotah Speedway on Friday, June 20th. 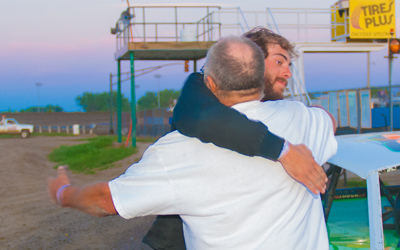 Over 30 of North Dakota and Minnesota's best INEX Legends drivers came to compete on the four day tour. The IMCA Sport Compacts had a tough start to their 10 lap feature. Exiting out of turn two, young Chase Seelye spun on the start, resulting in a complete restart. On the restart, Nylee Dimeo got loose on the backstretch and spun, collecting Jamie Schalfmann who had no where to go. As the field took the green flag for the second complete restart, Alex Thompson got in the bumper of rookie Brandon Anderson and spun Anderson in turn two to cause yet another complete restart. Pole sitter Nic West led the field to the green flag and led one lap before Michelle Stoxen broke an axle and came to a stop on the backstretch, drawing the caution that would end the race due to exceeded time limit. Nic West, who only led one lap, picked up the feature victory over points leader Josh Roehrich, Kody Stoxen, Sammy Woodall and Alex Thompson. A 10 lap IMCA Modified concy kicked off the night after intermission. Only the top four would t ransfer to the feature. Minot's Shawn Anderson blew by pole sitter Mike Nelson on the start and quickly pulled away from the field. Nelson slid into the clutches of Jordan Huettl and they battled for second until Huettl drove away on lap three. Nelson's car began to fade, losing positions to Quentin Kinzley and Herb Bargmann. A caution with three laps to go, regrouped the field and on the restart, Kinzley powered by Huettl for second. Huettl's car bobbled in turn two, allowing Bargmann to close oh him quickly. They raced hard coming the checkered flag but Huettl held off the veteran for third place. Quentin Kinzley finished second behind concy winner Shawn Anderson. An INE X Legends concy was needed to determine the last four positions of the Legends feature. Monte Gawryluk started on the pole for the 10 lap shootout. Barnesville, Minnesota's Josh Julsrud grabbed the lead before a caution reset the field. Andrew Jochim of Wishek challenged Julsrud for the lead on the restart and they battled side by side for several laps before Jochim took the lead on lap three. Julsrud had his hands full defending Nathan Watne for second, Watne took the position a lap later and challenged Jochim for the lead. The two drivers battled, door to door until Watne dove low in turn two and took the lead with two laps to go. 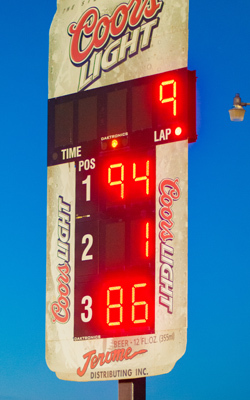 A caution would end the race due to exceeded time limit. Nathan Watne led one lap to win the concy as Casey Martin finished second ahead of Brian Hanson and Josh Julsrud. 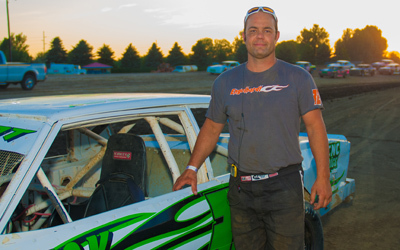 Dickinson's Paul Wanner led early in the Hobby Stock feature after starting on the pole. Wanner would have company at the front as Jeremy Engelhardt blew by Dylan Thomas on a lap three restart. Engelhardt dove low under Wanner and they raced side by side until Wanner spun out on his own with seven laps to go. Engelhardt inherited the lead and pulled away from second place Thomas. With five laps to go, Jaren Wald challenged Roy Erickson for third place as his cousin Wyatt Rath-Wald lurked in fifth. As the checkered flag neared, it was a three car battle for third and exiting out of turn four and coming to the checkered flag, Wyatt Rath-Wald just narrowly edged Jaren Wald for fourth place. Roy Erickson held onto third place behind second place Dylan Thomas and feature winner Jeremy Engelhardt. 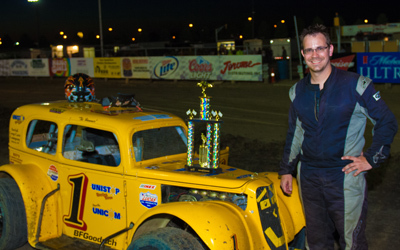 The feature win was Engelhardt's third victory of the year. Shawn Becker grabbed the lead from pole sitter Tanner Dosch to lead lap one in the WISSOTA Street Stock feature. Dosch challenged Becker for the lead and as they raced side by side for several laps, allowing third place Matt Dosch to catch them. Tanner Dosch shuffled into the lead on lap six but Becker rallied back, challenging to retake the lead. 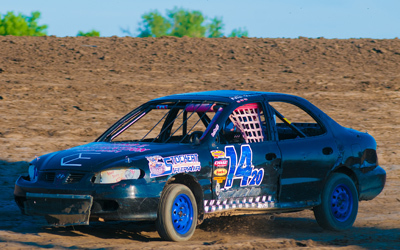 While racing three wide, Matt Dosch claimed second position from Becker. Tanner and Matt Dosch distanced themselves from the rest of the field and continued to race side by side for the lead. A caution with six laps to go gave Matt an opportunity to over take younger brother Tanner for the lead but Tanner's high line prevailed. Tanner held off Matt to win his first feature victory of the year. Shawn Becker finished third while David Falkenstein and Eric Harpole rounded out the top five. Stormin' Joren Boyce blew by pole sitter Russ John on the start of the IMCA Modified fea ture. Boyce pulled away from the field as John tried to hold off Mark Dahl for second. Dahl took second position from John on lap five and John started to fade, losing positions to Brian Swenson and Shawn Strand before a caution on lap 10 regrouped the field. On the restart, Shawn Strand slipped by Swenson and Dahl and challenged Boyce for the lead. Strand dove low under Boyce and took the lead when Boyce's car bobbled in turn four with 10 laps to go. Strand was in a class all of his own and led the final 10 laps to win his first feature of the season. Minot's Spencer Wilson finished a distant second ahead of Tracy Domagala while Eric Burwick made a last lap pass to finish fourth over pole sitter Joren Boyce. Pole sitter Shane Williams led early in the INEX Legends feature. Donavin Wiest quickly passed Loran Anderson for second, bringing Troy Hoff with him. Wiest and Hoff battled with Williams for the lead. Young gun Hoff shuffled into the lead on lap six but Williams retook the lead one lap later. Steven Kuntz, who started 15th, made it a three car battle for second with Wiest and Hoff. As they raced hard for second, Paul Morman and Drew Papke lurked in fifth and sixth. A caution with three laps to go set up a green-white-checkered restart. Williams pulled away on the restart but Kuntz hugged the inside guardrail and grabbed the lead with two lap to go. Williams rallied back using the highline but Kuntz's low line would edge Williams at the Open Road Honda finish line. Steven Kuntz led the final two laps to win his second feature of the season. Troy Hoff finished third ahead of Drew Papke. 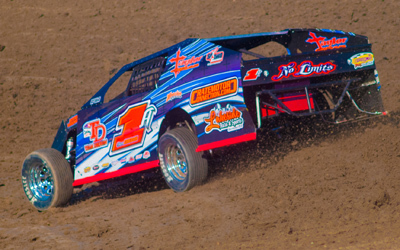 Wishek's Paul Morman made a last lap pass on points leader Donavin Wiest to finish fifth. *A red flag halted the race with three laps to go for a terrifying wreck involving Loran Anderson, Dean Julsrud and Charles Woock. Anderson made contact with Julsrud which sent Julsrud into the side of Woock, sending Woock spinning then barrel rolling twice. Woock was fully conscious and alert but sent to a local hospital as a safety precaution. 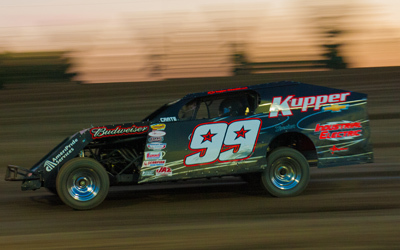 Up next on the high banks of Dacotah Speedway is the Kupper Chevrolet, Dakota Classic Modified Tour with IMCA Stock Cars on Thursday, July 10th. Brought to you by Coors Light, distributed by Jerome Distributing. Fan gates open at 6 and the green flag flies at 7pm.